What was like in Lemuria during the last 500 years of this ancient and enlightened society? Welcome to the free audios of the Kryon channels, given by Lee Carroll – the original Kryon channel. 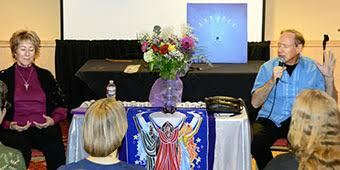 While the Lemurian Sisterhood® is for women, Lee often makes a guest appearance at the beginning of our Sacred Circle and brings forth the loving and profound messages of Kryon, and we are given glimpses of what it was like in Lemuria – and in the Sisterhood – during the last 500 years of the continent’s spiritual civilization. Kryon is a loving angelic entity that has no gender. Find out more about Kryon and Lee Carroll here.